B randing the American West, the new exhibit in Brigham Young University Museum of Art’s main floor gallery, is so full of colorful, engaging, accessible paintings, by talented, brand-name artists of regional interest, that patrons likely will find themselves breezing through the exhibit, enjoying one scene after another, with little regard for the larger scope of the exhibition. Sure, it won’t be hard to pick up on the similarities between the paintings of, say, Charles Russell, on one end, and Minerva Teichert on the other, and the cinematic tradition of American westerns they serve to bookend; nor to notice the changing depictions of Native Americans from fearsome “savages” to serene nobles as artists shift their gaze from the Plains to the Southwest; but there’s so much good stuff to look at, from a mini-exhibit within the exhibit devoted to Maynard Dixon, to the dynamic paintings from the Taos school depicting rituals and festivals at the pueblo, that one won’t want to be bothered with wall texts and explanatory tombstones. Take home with you, then, a copy of the coffee table-ready volume edited by Marian Wardle and Sarah E. Boehme that accompanies the exhibition. Then go back and take another look. Published by the University of Oklahoma Press, Branding the American West: Paintings and Films, 1900-1950, is elegantly designed and chock full of brilliantly reproduced images, but more importantly, its essays probe the complex nature of paintings and films of the American West of the first half of the 20th century from angles the exhibition only briefly outlines. It may have more than one patron rethinking that Joseph Henry Sharp hanging above the mantle. As the six writers in this 224-page catalog point out, artists of the American West were always engaged in a process of branding, of providing a hungry public with a sometimes shifting but always simplified version of the region—whether it was the wild and dangerous West needing to be broken, like the bronco in a Remington bronze, or the mystical lands of the Southwest where the last remnants of the vanishing Native were to be found. If art was the weft of these branded tapestries, commerce was the warp. As Susan S. Rugh writes: “without tourism, there would have been no Taos school of painting.” We like to think of the Taos school as reverent chroniclers of a people and way of life they discovered, untouched by modernity. But Taos had been connected to the larger world as early as 1830, when Kit Carson made it a trading hub, and however they felt about the people and land they were depicting, the artists in Taos were in business, stakeholders in a myth which they hawked to as large a public as possible. They were not alone. Before Maynard Dixon — who receives the lion’s share of attention in both the exhibit and the catalog — delved deeper and deeper into slot canyons in search of the “real” West, he was creating advertising posters for railroad companies that shipped an ever-increasing number of tourists and settlers toward those canyons. The “real” West was always deep and layered, as Elizabeth Hutchinson shows in her essay on the festivals and rituals of the Taos Pueblo. The Taos school artists had been trained to be keen observers and, consciously or not, they captured mainly details that reveal the complex nature of a supposedly simple and ancient society, from their syncretic religious festivals that blend Christianity and ancient traditions, to the complex mix of neighboring tribes that was always as influential on the Taos society as their relationship with the white man. Depictions of the American West are deep and layered as well. Leanne Howe’s charming and learned analysis of the American western, a genre created in the early days of cinema as a specifically American story, includes a discussion of Wild and Woolly, an early silent film where “intertextuality abounds” and the filmmakers take the myth their form was created to perpetuate and lodge it between tongue and cheek to savor all its juices. Like bucking broncos, myths are hard to bust, especially when they are embodied by images that have become part of our national consciousness. So, if you enjoy your Manifest Destiny clean and uncluttered, your favorite paintings pure and nonthreatening, this book is not for you (you should be able to breeze through the exhibit without being overly troubled); but if the story of our American West appeals to you as a rich tapestry in all its various and complicated narratives, Branding the American West will be sure to take you to new and interesting vistas. 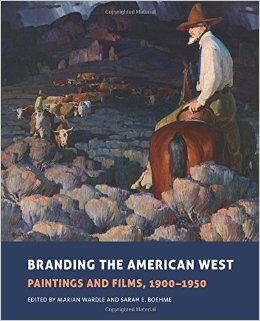 Edited and with an introduction by Marian Wardle and Sarah E. Boehme, “Branding the American West: Paintings and Films, 1900-1950,” features essays by Dean Rader, John Ott, Jimmy L. Bryan Jr., Susan S. Rugh, Elizabeth Hutchinson and LeAnne Howe. The exhibit continues at Brigham Young University’s Museum of Art through August 13.